For riders whose safety demands full face helmets this is an in-helmet mic/speaker system for use with Icom, Maxon, Ritron and Vertex radios. Electret mic system reduces background noise to an absolute minimum. Installs in the helmet pads using only VELCRO brand touch fasteners (included) and is fully modular and removable from the helmet when not needed. 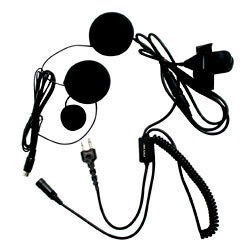 The microphone features a large, rubber-covered Push-To-Talk button that can be secured to handbars or held in the palm of the hand and is easy to find and operate, even while wearing heavy gloves.